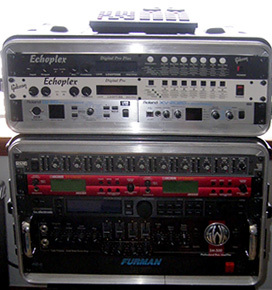 Glenn's rack includes two Echoplex Digital Pro Loopers, two Boss VF-1s and the Roland GI-20 MIDI converter and XV-2020 synth module. Greg, Tom Griesgraber, Emmett and Glenn after the last concert of the First National Chapman Stick Festival in Ann Arbor, Michigan, 2006. 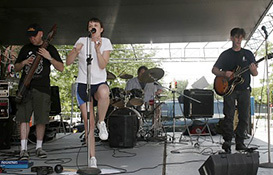 Glenn Poorman has been making music ever since he was "old enough to reach the keyboard." Starting with piano, and then picking up saxophone, electric guitar, bass and ultimately Chapman Stick, he's been soaking up rock, prog, classical and jazz influences all along the way. As a member of the bands Conditioned Response and Coup Detroit, he's been involved with the Detroit music scene for 25 years, and within the last few has developed a solo Stick performance based on looped compositions, MIDI soundscapes and drum machine grooves. In 1982 he began making home studio recordings of original material at a house with the address of "121 Normal," a practice which would develop into a strong synergy of composing and recording. Glenn moves easily from solo to group contexts, and with a composer's instrincts deftly exploits the range and timbral depth of his instruments, which are centered on The Grand Stick and lately the Ato Stick, but just as appropriately piano, synths, bass and electric guitar. His compositions are full of melodies and countermelodies, morphing rhythmic and atmoshperic layers, and high-energy grooves and solos. His new CD, 121normal, puts all these voices into play, together with narratives of interwoven voice samples and some straight-up singing. His layering of Stick tracks mimics his live loop-based performance, but unlike many musicians who rely on technology to pull it all together, Glenn is a skilled performer, on all his instruments, both live and in the studio. He's also a major force in the Michigan Stick scene, one of the most active and broad-based anywhere in the world, where the 2007 Midwest Stick Seminar is taking place from August 4-5, and where last year's 1st National Chapman Stick Festival brought together performers from all over the US for a day-long street festival performance. I was able to ask him a few questions before heading off to Michigan for the seminar and a couple of shows we're doing together in Michigan (see the INTERVIEW below), and New Mexico-based Stickist and song-writer John Edmonds was kind enough to write a review of his new release in time for this article (see REVIEW below). Greg: You made some great use of the Alto on this recording, especially "1000 Words," which is all Alto. How would you describe the way it plays and sounds compared to your Grand Stick? Glenn: The Alto was almost more of an accident. With the exception of "A Thousand Words", the other tunes were in progress when I picked up my Alto and I hadn't originally planned on using it. It ended up having such a cool sound though that I found myself reaching for it in places where, before, I would have tried using picked acoustic guitar. It has a nice full sound in the higher registers that come out clearer than they would playing my Grand up on the high frets. They actually compliment each other very nicely. GH:This recording is really a kind of a hybrid. It represents your compositions but in a different way from the way you perform them. When you perform many of these tunes live, you lay down each part as a loop. How did that process translate into a mutli-track recording process? GP: I went through a bunch of iterations on that. In my first passes on these tunes, I tried to sync the recording software up to my Echoplex and try to capture the spirit of the live performance. That was pretty difficult to accomplish and still maintain separate tracks for the loops so I ended up turning the loopers off and just recording the loops one at a time. It's wierd because there was a fair amount of editing using just the regular keyboard and mouse. I would lay down a few iterations of a loop, pick the best one, and then create a whole track with it. I tried to get more into full performances when I got into the more prominent tracks though just so I could maintain the feel of a human being playing music. Of course, that makes the process more enjoyable for me as well. GH: What tunings and string gauges are you using? GP: On my Grand, I use light gauge across the board and I use the Classic 6+6 tuning. I used to use light gauge melody and heave gauge bass and some of the tunes on this record were recorded that way. On my Alto I use the Extended Alto tuning. I really love the tuning. Mainly from a logistical standpoint. It's tuned exactly like my Grand (minus a couple of strings) except one octave higher. Even aside from the logistics though, I like getting up high with that tuning. It's got a ring that Emmett described as "icy" when he was here last summer. GH: Have you considered trying to perform these pieces with a group? GP: I can't say it hasn't crossed my mind. Working with Coup Detroit though, I really get my fill of working with a group. I really love it too but it's also nice just to do these tunes on my own terms. If I ever did get the opportunity, I would more likely put something together on a short term as opposed to forming an official "band." I did do "London Trains" with a band back in 80s. That version sounded very different. GH: A lot of Stick players perform as soloists and in bands, yourself included. Is there something about the instrument that makes this easier to do or more compelling to you, than say, keyboards or guitar? GP: When you combine the two ... yes I think so. In a band, I probably enjoy playing guitar as much as I like playing Stick. As a soloist, I love playing the acoustic piano as much as I like to play Stick. To do both though, the Stick wins out for a few reasons. The first and most obvious is the range of the instrument. You can get a nice wall of sound all by yourself. In Coup Detroit I hold down the bass and, at the same time, play both rhythm and lead guitar parts trading off on those roles with Dan (full time guitarist). As a solo, I can use the looper to build up layers and use processing to really capture a variety of sounds. Realistically you could do what I do using loops and keyboards. While I like the piano though, I've never really gotten into keyboards driving MIDI sound modules. I always feel like there is a disconnect there between me and what I'm hearing. With the Stick, I get a connection that's more organic. I feel like I'm immersed in it. There's been times when I've gone into my practice space, gotten the loopers going, and improvised well into the early hours and not even realized it that hours have passed. Some of the tunes on this record were born that way. GH: The Michigan Stick scene is incredibly active. How did that happen and what's your role been in making that way? GP: That really started with Oz (Steve Osburn). He was an authorized dealer and is one of the few who is still a dealer today. He's a really active teacher as well and started a handful of local people on the Stick. The funny thing is that I didn't know him when I started. Right when I took delivery of my first instrument, Yuta told me about Steve. He was just 30 minutes from me and I didn't know. So we hooked up and he gave me my first lessons. Shortly after that, we organized our first seminar event together. He had actually organized the first Midwest Seminar in 1999 right before I got involved. He was aching to do another and I volunteered to partner up with him for what, at the time, were purely selfish reasons. By then, Steve had already been teaching Pete Gilbert and Wes Teregan and they had formed the Michigan Stick Trio. A short time after that, Gary Jibilian contacted me about instruments and Oz helped hook him up with his first NS. That's the way it's always seemed to go here though. Every year we seem to have one or two new local guys coming to our seminars and many of them find there way here without any prodding from the rest of us. I think it's just a byproduct of the music scene in Detroit. There's a very underground vibe here so it doesn't surprise me that the Stick is as popular as it is. There's a lot of cool history here too. We have a guy coming to this year's seminar who played bass for the original Four Tops. GH: What's your next Stick project going to be? GP: Hard to say! I want 121normal to continue and I don't see being at a loss for material for a while. While much of this release is new material, there are a few re-recordings and re-arrangements of old tunes of mine dating back to 1982 or 1983. There are plenty more where those came from and several that I've already started thinking about how to redo. I have a growing number of clean solo Stick tunes as well that I've kicked around trying to record. That's less of a priority right now but it's something I could noodle at for quite some time. Of course, there's still Coup Detroit and we've got loads of new material that we want to start recording. We're really psyched about the possibilities for a second record. I sat spellbound one recent evening in a small-town theater watching an indie Hycam film scored with the haunting wails of Alan Parsons' "Genesis Ch. 1 V. 32." The very next day I received my long-awaited copy of Stickist and multi-instrumentalist Glenn Poorman's album 121normal. Maybe it was coincidence, but it felt like synchronicity after Parsons' long-forgotten I Robot had filled my head through the night. While Parsons and Poorman have distinctly different styles — in fact the two albums sound very little alike — their works share a vibe of quiet and harmonious dissent, a dark commentary in sweet lullaby's clothing. So it makes some sense that these two energies have cycled around in almost Saturnian timing. I hadn't heard the soaring strains and rumbling machinery of the Parsons album in nearly 20 years, a period during which Poorman was developing a sequence of his own studios, songs, tracks, loops, and other musical visions. Now, after more than two decades, Poorman's dreamscapes are born, in the form of a not quite solo effort also called 121normalâthe project and the album both named for the birthplace of their creator's original conceptions. Prophesy and politics aside, Poorman shares an appreciation for tasteful repetition and intelligent automation, a knack for good grooves and memorable melodies, a progressive approach to otherwise pop sensibilities, and a compass for collective destination not quite reachable with only one pilot. Whereas Parsons favored male vocals and glassy 12-string dreadnaughts, Poorman goes for the girls, 12-string Grand Stick, and 10-string Alto. Both artists make fervent use of howling electric guitars and light-stepping electronic drum sequences. Poorman's judicious orchestrations are a clean canvas for his focused Stick tones and nimble tapping. In all, the album carries a polished celestial glow from start to finish. Everything is in its place and time, and Poorman has captured the sounds of his Sticks with fine precision. 121normal opens with the familiar "Frantic in Nature," which in solo variation has been one of Poorman's live staples. This fully orchestrated rendition encompasses much of what's to come, with its swirly, phase-shifted, ever panning Stick loops and staccato arpeggios. "Sunday in Salt Spring" slows the frenetic momentum and introduces the next common thread throughout this work: irresistibly sweet melodies that cascade one over another, always reminding us of a world that's gorgeous despite its troubles. With remarkable clarity in the Grand Stick's upper registers, Poorman achieves a dulcimer-like pling that chimes over a looped pedal tone and creates a sweet interplay with acoustic piano. The third track, "Lookin Good at Eight," gets funky and brings on the album's next major character, the prerecorded radio voice. A random-sounding but no doubt well-calculated ostinato bounces through lunar wind, bleeps and bloops, and more pyramids of layered Sticks. "Remember When" seems to pay tribute to some likely Poorman influences: the watery Patch of Shades-era lead work of Emmett Chapman himself, the mellotron pads of King Crimson, and some sizzling solos that sound more like the fleet-fingered prowess of Joe Satriani than the woody soul tones of Parsons' Ian Bairnson. Up next is a dreamily tapped Alto Stick showcase, "A Thousand Words." Then "London Trains" arrives from a familiar place, recapping elements of "Frantic" but with the added vocals of Mary Kay Blitz. Fittingly, its softly ricocheting drum patterns and silky smooth keyboards deliver a British-sounding urban slickness. It's a classy buildup to the floating and beautifully restrained "Langmuir," a short Enoesque cycle that serves as a midalbum intermission of sorts. After the break, we hear the Alto Stick again in "Hard Times," with a cheerful and lilting Stick groove and a chirpy, almost bagpipe-sounding counterpoint. "To Walk in Time" also features the Alto and brings back the female vocals, this time those of Julie Marcos, and showcases hot electric guitar leads in contrast to the song's cool, lolling, kick-it-over groove. 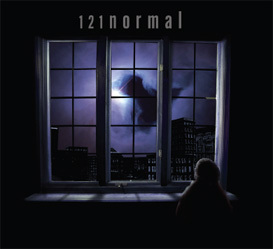 By now it's clear what 121normal is, at least in part, all about: marrying the Stick's historically prog rock roles with its versatile applications in the pop-rock-folk-world-fusion mixes. This makes the CD very accessible throughout, and it's bound to appeal to a wide audience. You're almost guaranteed to come away from 121normal with any one (and probably more) of its many hooks, beats, riffs, and melodies lingering in your mind. The role of Greg Howard as co-producer, mixer, and mastering engineer is evident at every turn of these tunes, not unlike Parsons' behind-the-scenes fingerprints on Dark Side of the Moon. Howard has meticulously mixed these songs to capture the depth of Poorman's textures and to bring out the subtleties of, especially, the full-range Stick timbres. By now, Stickists have come to know Poorman well through his broad involvement in the community, from his live performances and seminar organization to his various online roles in furthering the instrument. His debut Stick-centered release has been a long time coming, and indeed it proves a logical, exciting, and fitting culmination of all those efforts. 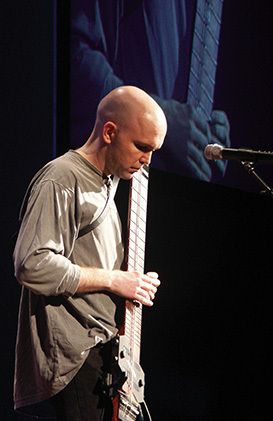 John Edmonds is a Stick player, composer and singer-songwriter based in New Mexico. His latest release is entitled Burn Down the Sun. You can find out more about his music at: http://johnedmonds.net/.